Another fantasy book has been released upon the young adult world, and, unsurprisingly, it’s a good one! Okay, so before I begin, I do have to admit that there are similarities between this book and other popular fantasy books, but this is completely okay. The similarities aren’t blatantly obvious and the major differences are rather huge. However, I would say, for the popular YA fantasy fans, Frostblood is kind of a cross between Red Queen and Ruined by Amy Tintera. It’s fast-paced, full of action, and rife with powered people. Ruby is one of those powered people. She’s a fireblood, perhaps the only fireblood now that the king’s wiped them out. While Ruby doesn’t seem to have a very unique personality, she’s strong-willed, and her fiery temper that comes about as a result of her powers is rather amusing at times, especially around Arcus. 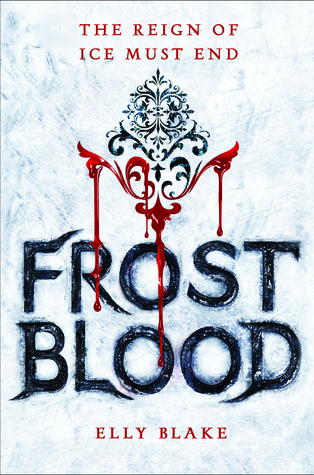 Arcus is the frostblood who saves Ruby from a group of the king’s soldiers. He’s also mysterious, emotionally and physically scarred, and a frostblood. I very much enjoyed him. Although, I’m hoping he gets some more character development in book two. As for the plot of this particular story, I managed to thoroughly appreciate the first half. While the prologue kind of made Ruby’s imprisonment seem less dire once the actual book began, everything did flow naturally after that. I felt Ruby’s pain and suffering, and I wanted her to become a stronger version of herself through her various trials. However, after the first half, things weren’t as focused. There’s a bigger emphasis on everyone’s powers, but no limitations are set up in regards to these powers, so it was a little confusing at times watching Ruby go from “I can’t throw fire at a bush,” to “I’m spouting out walls of flame towards this enemy.” Also, the gods aspect along with the magic voodoo going on kind of threw me off. I was expecting this story to be solely about two races of powered people, but there ended up being more magic involved. Sometimes, I was okay with this, other times, it seemed strange. None of these minor issues really took away from my enjoyment. It’s a fun book that uses some regularly seen fantasy tropes and shapes them into a unique storyline. I just hope book two sets up an even bigger world with even greater stakes. Oh, and there also needs to be a map in the finished copy. A map would be very helpful. *Note: I received an ARC of this book to review from the publisher via Netgalley. This in no way affected my opinion/review. I really enjoyed this one, too! I actually liked the second part of the book more than the first because I found it a bit more exciting. I do hope to see some more of Arcus in the next book. I would like to learn more about him. Great review!